It had taken the seven astronauts ten years in cryogenic freeze to travel the 4.2 light years from Earth to its nearest stellar neighbor in space. None of the long-range observatories and robotic probes gave even a hint that Proxima was going to enter an extended period of instability just as NASA’s first manned mission arrived at what was believed to be an Earth-like exoplanet. Now they knew why they detected no life signs once they could engage their close range scanners. Periodic bombardment of deadly radiation from its nearby sun would destroy all organic matter. Commander Wallace continued to look up through the thin atmosphere above her admiring the awesome power and beauty that would soon kill them all. 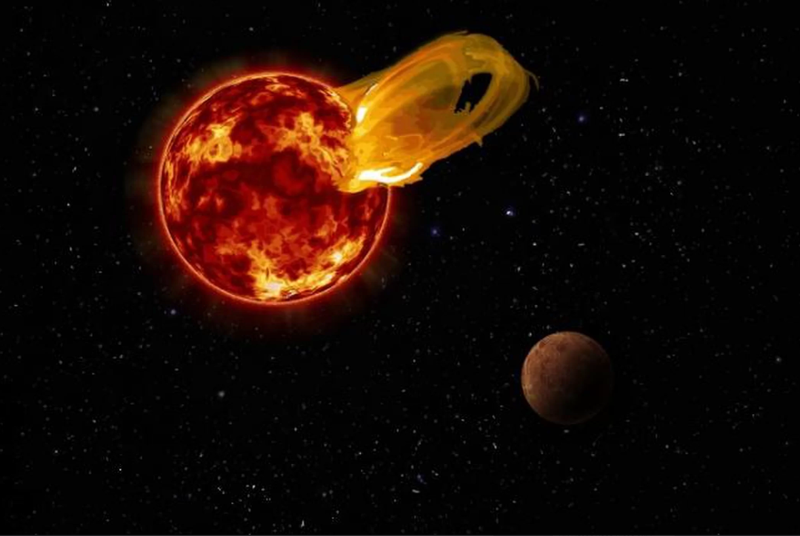 I didn’t want to write about leaves or clouds but when I read the Space.com article Superflare Blasts Proxima b, the Nearest Exoplanet, Dimming Hopes of Life published yesterday, I knew I had my story. I had to change a few things since we know these flares are more or less regular so the chances of life ever developing on Proxima B are slim to none. No one would send humans to such a place so I decided to make the flares rare and unpredictable. Nature is beautiful but sometimes that beauty is also deadly. Quite a desillution they’ve encountered, it seems. Nice story. Proxima B is a fascinating planet indeed. Fascinating and in all probability, lifeless (alas). Didn’t you read my source article? Regular blasts of radiation from Proxima Centuri probably scattered the atmosphere and water or most of it. Even the article’s title pretty much says that. It’s why I wrote my story as I did. SciFi author Larry Niven once wrote a short story called “Inconsistent Moon” about what would happen if our Sun became “variable.” If it happened and you were on the night side of Earth at the time, not only would you have a chance to survive, you’d see clues ahead of time if you knew what to look for. Fascinating James, nature can be beautiful in even its fiercest form. My son is currently working in New Guinea where a 7.6 earthquake struck on Tuesday morning. The destruction is catastrophic and loss of life huge, but you still wonder how it is nature works sometimes. The natural world and whatever’s beyond it is still in charge no matter how much we think it’s us. Its a shame so many people don’t believe that though. Glad you enjoyed it, Deb. Thanks.